I’ve just come back from a weekend at my parents’ in Somerset. We travelled there in part on the A303, and it seems this was more or less the same route that Pitt the Elder, Earl of Chatham and his family would take to travel to their house at Burton Pynsent in Curry Rivel (there was, of course, no dual carriageway in those days…) The following is an account of part of a journey from Burton Pynsent to London written by Chatham’s wife, Hester, to her husband. I don’t think I have the date, but the letter is quoted in Brian Tunstall’s William Pitt, Earl of Chatham (London, 1938), pp. 435-6. I’m happy to say our journey in Somerset was less eventful than Hester’s was! The road from King’s Weston to Aynsford Inn, greatest part narrow causeway, like the Ilminster Way, requires careful driving; we performed it very well. The chaise horses broke two rotten traces, not from any fault of theirs, but it is all for the better, they cannot serve again. Wheel of said Chaise broke as it got to Aynsford Inn. Road very well from hence till within two miles of Hindon. Then very heavy, not being made, but safe. At Hindon find our horses. The landlord does us the honour to ride as postillion at wheel himself, because nobody could ride the horse he did, but himself. Went very safe, the road for the next couple of miles very bad indeed, broke only one trace this post. After the two mile on to Deptford, good enough. House at Deptford very bad. Put us in mind of our Chard dinner. From hence to Amesbury, road very good, but fortune did not favour Bradshaw and the damsels [the servants followed in another coach]. About 3 miles from Deptford the wheel horse fell down, the postillion under him, but the admirable care and dexterity of William Footman whose cleverness in travelling I cannot enough praise, extricated him from this perilous situation without his receiving much hurt. We set forward again. Within a quarter of a mile short in two breaks the perch of their chaise. We took our party immediately, brought our two maids into our coach, with trunk, band boxes etc., put on one pair of the unfortunate chaise horses to our four in consideration of the additional weight, send William forward to fetch a fresh chaise from Amesbury to meet Bradshaw, who was to march on foot till they came to him with his favourite grippine. We continued our way with our three postillions most happily to Amesbury, taking a view of Stonehenge in our way. We went directly then to Andover with excellent horses and got in about seven. With an American invasion of Canada imminent, the decision was made to withdraw John from Canada. John seems not to have had any say in the decision: it was his mother, Hester, Countess of Chatham, who came to the conclusion that John was better out of the army. Lord Chatham was at the time suffering from one of his periodic fits of depression complicated by gout. The following letters on the subject were written by Hester to her husband’s cousin, Lord Camelford, and are in the British Library (BL Add Mss 59490). “I am just come from having put the question to my Lord on what his opinion was as to his Sons continuance or not in the Army. This touch’d so many tender strings that it was impossible it shou’d not agitate Him. However he gave me his decided opinion that his quitting was indispensable, and that in the present circumstances an Exchange was not a desirable Thing, as there were strong objections to his remaining in the Army, and declining to serve.” Lady Chatham therefore asks Thomas Pitt to tell Lord Barrington of “Pitt’s Resignation, in the following Words, `That the continuance of the Unhappy War in America makes it necessary humbly to request Permission of HM for Lord Pitt to resign his Commission’”. Lady Chatham is not pleased that “our Son shou’d sacrifice a Profession that is agreeable to Him, and in which we might flatter ourselves He might have some success”. The decision was “very unpleasant”, but she is “compensated only by the Persuasion that there is a Propriety and Fitness in the doing it”. Pleas to acquaint My Lord & Lady my Lord Pitt, is perfectly well, and has been so ever since he left England, his Lordship is not grown much in high, but is spread much thicker which I think his Lordship looks better for, the only inconvenience attends it, is his Cloaths being to little, and have no remedy but letting them out, as thair is no new Regimentals to be got at Quebec, & I will Venter to take the liberty of acquainten my Lord & Lady how my Lord Pitt passes his time in America, as I think it will not be disagreeable, for them, to hear, tho was Lord Pitt to no I had taken such a liberty he might be angery with me, His Lordship is up every morning and Dresst by seven o’clock, reads till nine, then to Breakfast with General Carleton ware his Lordship intirely Boards, attainds the Parade every Day at Eleven as that is the sure of the gard mountain, tho his Lordship his not a great deal to do thair, as the 47 regiment is not here, only som small imployments as being Addecamp to General Carleton. After his Lordship has attainded the Parade he rides or walkes if the wather will permit, if not, Reads fences or exercises with the firelock as he is learning the Exercise of the regiment that is here, as it is different from the Twentyth. His Lordship has been drest and at the Chateau, every day by a Quarter of hour before Dinner time, thare has been generally every week two large entertainments at the Chateau so that his Lordship sees a great deal of different Company. But Quebec is rather dul for his Lordship at present as greatest part of the Military Gentleman is gon to Boston, His Lordship has frequently dined with Major Calwell who lives two Miles from this town, General Carleton and Lady Marria’s [Carleton’s wife] politeness to my Lord Pitt when on board of Ship, and here, is very Great, as they never think they have all their family when my Lord Pitt is not there, I am afeard I shall take to great a liberty in given so long account of my Lord, so that I will conclude with begin leaf to offer my Duty to my Lord and Lady, Lady Hester Lady Harriot, Mr Pitt & Mr James Pitt, pleas to acquaint Mr James Pitt I have not seen any Soldier, in America, that is able to Exercise any Thing like so well as Serjeant Rogers [? I have NO idea what this is about], The wether upon the whole has been very fine ever since we landed here, but know growes rather cold, Heavy rains and a great deal of snow is daily expectd, notwithstanding the severity of the whether every body here perfers winter before Summer, after the snow is down and the frost thoroughly Seting. 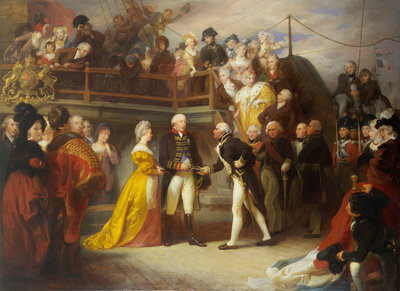 My Lord Pitt Desires to have sent by the first Ship that Sails for Quebec, Cloath & Buttons & other trimmins for two sutes of Regimentals, with two Epaulettes to each Coat, doe or buckskin to make two pair of Rideing Breeches a new saddle and bridle with bit and Burdoon the same as what his Lordship youst to ride Serjeant in, to send 20th of Pipe Clay, for cleaning of Cloaths. A slightly ironic one this, as “punctual” is not a word one sees associated with the Second Earl of Chatham very often. A positive and indeed rather defensive paragraph— obviously someone thought it necessary to defend Pitt’s choice of his brother to replace Lord Howe at the Admiralty. Particularly, as I said, because until then John had shown no sign that I can see of being interested in politics, at least not in a participatory manner. I will give a medal to anyone who can find an instance of his speaking in Parliament, either before or after he took office. On the other hand I am more than willing to concede “diligent”, at least insofar as he genuinely seems to have cared about business. Chatham attended most cabinet meetings, was a regular attendee at Court functions and levees, and the gazette of his movements in the papers is full of accounts of him attending Admiralty Board meetings, acting on committees and participating in general House of Lords business. He may have been silent but he wasn’t invisible. Perhaps if he hadn’t been Pitt’s brother his reputation would have been better? But then he would almost certainly not have reached high office in the first place. And I would not be discussing him here.